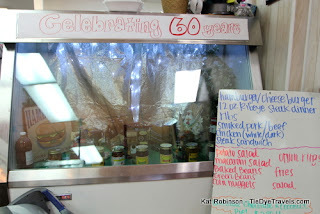 60 Years at Keeney's Food Market in Malvern. 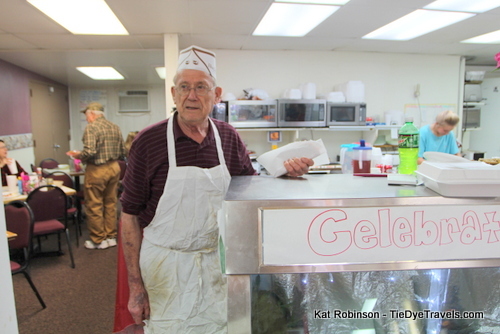 This week, a Malvern institution hit the 60 year mark. But 15 years ago, it all nearly came to an end. 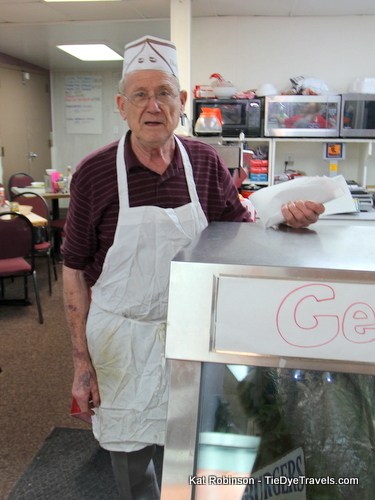 Learn about Keeney's Food Market, a hometown secret. Watch the video at the end of this article. Last week, I had the privilege of speaking before the Arkansas Festival and Events Association. I talked with many of the great people who are organizing celebrations around the state, including a group from Malvern. Several of those individuals asked me if I'd been to Keeney's. Why yes. Yes I have. But it's been about 30 years. Back in the 1980s when the earth was still molten and rocks were soft (that's a joke), I was a young pre-teen spending time with relations in the Malvern area. I rode my bike a lot on the weekends. I mean, a LOT. I loved to roll over to the junior high and ride up and down the slight ramps in the courtyard... there were no security gates back then, no one trying to keep people out or in. I'd head up Cherry Street from there, rolling down the sidewalk into a dip and back out of it. I have recollections of a small grocery store at Cherry and Highland, where I could get a peach Nehi out of an old machine. But just as often, I'd turn left onto Mill Street and roll down, cross Main Street and hit the grocery store a block further down. That was Keeney's. Back then, there were drinks inside the door to the left, produce further back and a deli counter where, if I asked nicely, I could get either a pickle loaf or bologna sandwich on white bread. It was always cool and a little dark going in, but it was a welcome spot and no one ever ran me out. I'd catch my breath, eat my sandwich and maybe some Cheetoes, drink my peach Nehi and get back out on the bike. It's probably been 10 years since I've spent any significant time on a bike (though I hope to change that this spring) and more than twice as long since I'd thought of that grocery store, but with such a strong constituency of fans I decided to add Keeney's to my list of places to visit. Getting there at noon was almost a mistake. There was not a spare place to park in the lot or along the road when I drove up, but I happened to see a lady walking to her van and I captured the spot she left behind. Smoke billowed from the back of the building, and the moment I opened my car door I salivated - something smelled extraordinary. Stepping inside, my eyes adjusted and I noticed the line at the two-register checkout and another line across the back of the store. I joined that second line until a couple of guys noticed me and waved me on through to the dining area. They were waiting for to-go orders. And that's the thing -- from the front of the store, I hadn't seen the cafe in the back. Hadn't noticed it at all, but there it was -- a section of the main part of the store sequestered off, then another section by the meat counter to the back, holding several packed tables of people all chatting and dining. 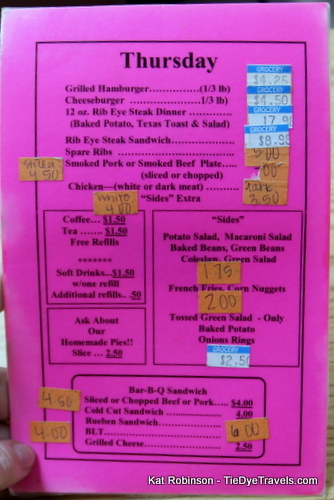 Like so many other great Arkansas eateries, there were white boards with dry-erase specials (this day showcasing hamburgers, cheeseburgers and a steak sandwich). 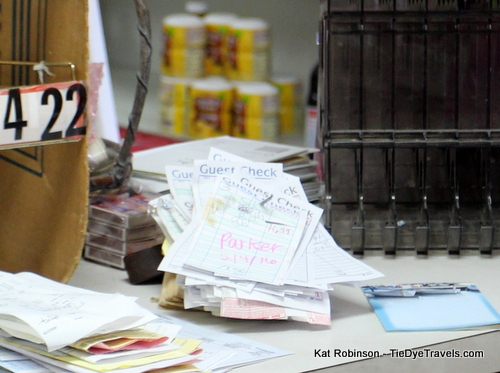 The prices are denoted by grocery tags. One of the waitresses saw me and asked me what drink I'd like while I had a seat and pulled out the single page menu. 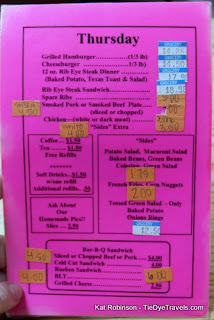 There are not a lot of choices, to be honest, on said menu - the hamburger and cheeseburger, a 12 ounce ribeye, a ribeye steak sandwich, spare ribs, a smoked pork or smoked beef plate, white or dark meat chicken, a handful of sides (potato salad, macaroni salad, baked beans, green beans, coleslaw, green salad, French fries, corn nuggets, green salad, baked potato and onion rings), a list of sandwiches (sliced or chopped barbecue beef or pork, cold cut, Reuben, BLT, grilled cheese) and a note to ask about the day's pie selection, all printed on the back side of a neon fuschia pink half-page that had been laminated. When she came back, I asked the waitress what she'd choose, and she said she was really in a ribeye mood but the ribs and chicken were also really amazing. I had to have that ribeye. 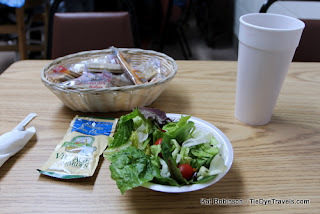 Sadly, the baked potatoes were all gone for the day, but I was able to get a side of macaroni salad. While I waited, I watched the people around me. Several had come in when I had, and this front room was bustling. I could see, too, through the kitchen counter to the other dining area with so many people bustling around, including a gentleman with a white paper hat on his head. This, I'd discover, was Mr. Charles Keeney. My waitress brought me back a lush green salad with a couple of grape tomatoes. She dropped off a packet of blue cheese dressing and stole a basket from another table that contained individually wrapped twins of Captain's Wafers and little breadsticks. It took me not long at all to get through the salad, which was really good for some reason. Meanwhile, a couple of men my age sat down at a table in the corner, right in front of me, chatting with the wait staff and Mr. Keeney as they came in about some TV station that hadn't come in the day before. Seems I came in one day after a milestone. That's right... on February 3rd, 1956, Keeney's Food Market opened. Charles bought the building and opened the store when he was just 20 years old. He and his wife Maureen still run the place after all this time. Seems I also started listening in the heated part of the conversation. The two gentlemen voiced their disappointment that the television station hadn't dropped by. Coverage of a rally by Republican presidential contender Donald Trump at Barton Coliseum in Little Rock bumped the Keeney's story from the assignment sheets of just about every news outlet in town. But that didn't keep the local paper, the Malvern Daily Record, from sending over a photographer. I also heard that Mayor Weldon came by and read a proclamation. That conversation went into the background the moment that steak was delivered to my table. The scent of it... was intense. The flavors overpowered air itself, a concentration of the gorgeous smoky, flamekist, savory essence that had been hanging on the wind when I arrived. It glistened. I felt myself starting to shake as I took my photos, trying to document this gorgeous slab of ribeye before my instincts took over for me to devour it. 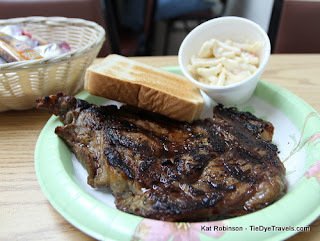 This large, nicely marbled flame-licked piece of meat had been brought to me with a side order of macaroni salad in a styrofoam cup, a buttered and toasted slice of Texas toast and its own juices... on a paper plate. Okay, a high end paper plate, but... paper. Either this was a cost-cutting measure that resulted in a lot of messes, or the cook knew how to properly treat a ribeye. My willpower weakened, and I poked at it with my fork and it almost fell apart. When my waitress dropped back by mere seconds later to ask if I needed any sauce, I only grunted, a mouthful of perfectly cooked medium rare beef preventing anything more than the most Neanderthal of communications. I nodded, finally picked up the knife, and poked at the steak some more. If you haven't figured out what I'm trying to say, this steak was so tender it fell apart on the side of my fork. I could have eaten it with a spoon. But how? How in the world? It had a great texture on the tongue, but still seemed to allow my utensils to puncture it as if it were melted butter. It was seasoned perfectly - perhaps salt, pepper, a little onion powder maybe, but otherwise just the flavor you only get with a barbecue grill. And it was everything I could do not to inhale it. I finally, about a third of the way through, caught my breath and sat back, sampling the macaroni salad (also homemade from the sort of noodles you think about in a Kraft Macaroni and Cheese packet) and its lovely mayo blend of flavors. The rest of the room began to exist again for me, and I could pay attention to what was going on around me. You think I'm kidding? 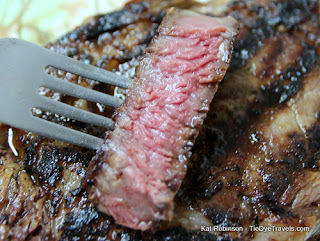 No, really - this steak could be the best steak I have ever had for lunch. I was catching bits of conversation again, and I looked to my left and noticed Mr. Keeney was talking with the diners at the table across from me. He chatted with a few other people, then sat down at the chair across from me at my table and asked me how I liked my steak. Oh, I should have mentioned, the moment I came back to this world, I asked for pie and got it. But the steak had left a blur. It was THAT GOOD. So here's this very nice gentleman sitting across from me, and a slice of chocolate pie (my waitress hadn't known what pies were left and asked what my preference was, and that's what I got) and I am just chatting away with him and absorbing this pie. 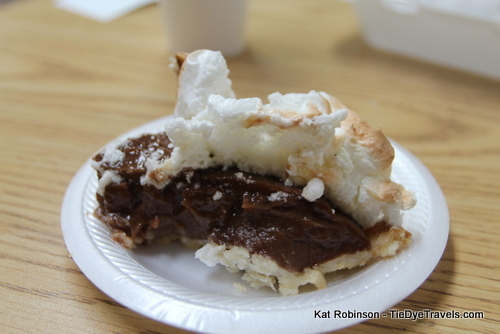 It wasn't the prettiest slice of pie - the meringue had torn as it was being cut, and instead of a perfect slice of white balanced on top of a brown custard triangle, it was fluffy bits of caramelized puffy egg white bliss over a tortured sea of deep chocolate custard, all on a blind-baked pastry crust. The meringue's flavor was perfect, with just the right amount of caramelization. The custard, not one of those out-of-the-box mixes, had a slight hint of a lemony twang to it, not unwelcome, maybe an influence of sour cream. But it was thick and it was smooth and I poked at it, too, the steak now tucked into a box while Mr. Keeney and I sat talking. Before I left, I asked if I could take his photo. Mr. Keeney obliged. He honestly had no clue who I was, but that didn't matter. We talked for a while about the TV station and the Trump fiasco and Arkansas politics and the history of the store. It had been his whole life, for him and his wife. But in 2000, it almost went to naught. See, back when I was small and riding my bike around town, the first knell had come for the myriad of little corner grocery stores and shops that peppered Malvern's neighborhoods - like that one I recall on Highland and the one over by the cemetery. This is where you went when you needed just an item or two or if you were just walking the block and decided to pick something up. Back when Keeney's Food Market opened, we dined differently, and while the neighbors were folks who lived in a city, they weren't that different from folks in more rural communities. The local corner grocery was a place to meet, to grab a sandwich at lunch and to pick up items for a dinner at home later. So many of our great long-lasting restaurants around the state share a similar history, particularly Cotham's Mercantile in Scott and Taylor's Grocery (now Taylor's Steakhouse) west of Dumas. There was a Walmart in town when I was a little girl, over on the edge of Malvern close to Perla. It was located off the northwest side of Highway 67 down off the side of the road, and it just sold merchandise. By the late 1980s, another bigger Walmart, located on the border between Malvern and Rockport, had opened. A few years later, a Walmart Supercenter opened out by the interstate. 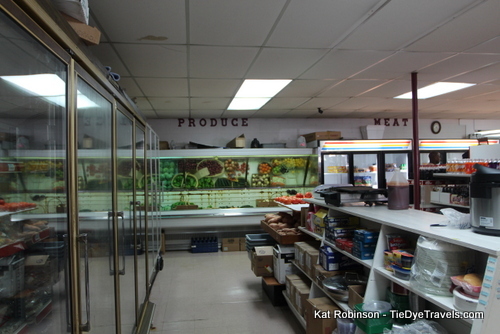 All those little corner shops and groceries peppered through Malvern's neighborhoods dried up. Keeney's nearly did, too. But CK, as folks call him, decided to do something different. He and his wife Maureen had about $45,000 set back for retirement. In 2000, they nearly lost the grocery store. So Mr. Keeney decided to open a restaurant inside his store. And darn if it didn't work. It's hard to tell it from the outside, but there are around 70 seats for diners tucked in the back of the old grocery store. 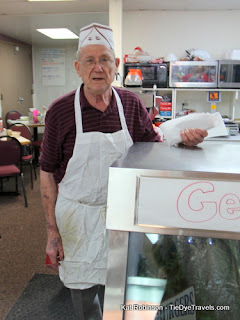 He and Maureen are still running the place - he cooks, she runs the register. Today, two of the Keeney's granddaughters were waiting tables. Other days of the week, a daughter is in there as well. And every person in there seemed to be someone the Keeney's knew... except me, this girl in a hat sitting at a table by myself. So Mr. Keeney sat and talked with me. He doesn't look 80 to me. He mentioned Maureen is 78. They're just moving along, keeping going somehow. He seems to enjoy the cooking, and answered all my questions about the steak and the little restaurant. He was interested in what I had to say, too, even though I never revealed who I was. Today, I was just a customer. Mr. Keeney says he doesn't plan to retire unless he just can't work any more. His knees hurt, and it was an effort for him to get back up out of the chair, but he's surrounded by family and the locals appear to adore him. I think he already has a pretty good retirement. I finally managed to finish my pie and get out of my seat a while later, after listening to Mr. Keeney talk with the two gentlemen sitting at that corner table for a while. There were no hard feelings about that TV station not coming out. There was a little pride shared about the local newspaper. Someone had called in asking questions and Mrs. Keeney was answering them at the register when I went to check out. She was so very polite, even though there were a good seven or eight people waiting. No one fussed. No one was in a rush to get out and go home. She finally told the person on the line that she had customers to check out and needed this only phone line to run a credit card. When I handed her my money, she bagged up my clamshell box and smiled. I think she smiled at everyone. I bought a copy of the Malvern Daily Record outside, the first time I can remember purchasing a newspaper out of a box in a long time. The Keeney's were on the top left corner, and there was a photo of the proclamation being presented by the mayor on page 3 and a whole page of photos on 12. This community is proud of this little neighborhood grocery and the family that still runs it - and still, somehow, manages to keep prices very low. My fine steak dinner with drink and pie came out to $20.15 after tax, before tip. I don't know of any other place you can get a decent 12 ounce ribeye for that. 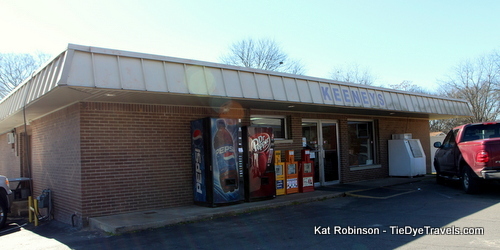 If you are heading to Malvern after reading this, know that Keeney's Food Market is only open 6 a.m. to 6 p.m. Monday through Fridays and 6 a.m. to 3 p.m. on Saturdays. 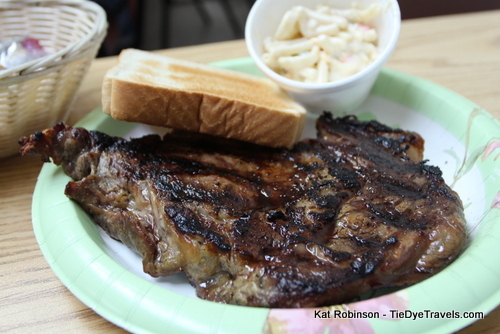 That's right - one of the best steaks in Arkansas is not available for dinner. Mr. Keeney said staying open for dinner would mean not being able to sleep all that much, since he and his wife are both up at 4 a.m. to get things started. Keeney's serves breakfast and lunch each of these days, and I will need to make a return trip for breakfast at some point. I hope there's steak and eggs on that menu. You'll find Keeney's Food Market at the corner of Dyer and Mill Streets. The best way to find it is to take Main Street (Arkansas Highway 9) southeast out of town, and turn right on Dyer. Beware - downtown streets are diagonal to the cardinal directions but Dyer runs east-west, so they're a little odd out there. There's some parking in the lot but if not, you can park along the road. You also have the option of dining like a local and calling in your order. If you'd like to do that, call (501) 332-3371. The meat loaf and the cucumber salad are to die for, too. I miss Keeney's. El Chico Cafe - An Arkansas Connection. Enjoy the North Shore in North Little Rock.